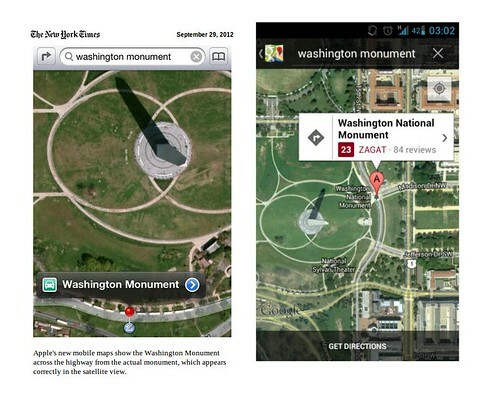 Maps in iOS 6 vs. Android: Where IS the Washington Monument? Apple’s new mobile maps show the Washington Monument across the highway from the actual monument, which appears correctly in the satellite view. Nine days after the maps’ release, the Washington Monument was still on the wrong side of the street. But something else changed. Timothy D. Cook, Apple’s chief executive, released an apologetic letter to customers on Friday, making the remarkable suggestion that they try alternative map services from rivals like Microsoft and Google while Apple improves its own maps. “We are extremely sorry for the frustration this has caused our customers, and we are doing everything we can to make Maps better,” Mr. Cook wrote. Clearly the Maps application has serious data issues, with screenshots showing up all over the internet of melting streets and destinations in the middle of bodies of water. But has anyone bothered to check and see if this “Washington Monument” example is actually a meaningful difference between Google’s Maps application on Android and the new maps app on iOS 6? Well, I just did. Here is a screenshot of iOS 6 on the left and a screenshot from Android on the right that I took with my own phone; it would seem that a similar issue appears on both. In iOS 6 and Google Maps on Android, the “location” of the monument is across the street from “the monument.” To be precise, zooming in on Android’s map application I can see that (according to Google Maps) the Washington Monument is right in the middle of 15th St. NW. I’m sure many drivers in DC would be surprised to hear that. This isn’t a new issue – “locations” are often contested. We might ask, where is the monument? Well, for what purpose? For navigation by driving? For walking? for determining the National Park boundaries? For those questions, the answer provided by both maps might be more accurate that it seems at first. But there is an assumption in our use of these maps, in our demand of accuracy from them, that when we ask for the location of a thing, that whatever aspect of that place we have in mind is the element that should be indicated by the map. So in this case, we want to be directed to the obelisk, not the grounds, and not the access road. But would users be any happier, or would the map be any more useful if the marker was directly on top of the monument obscuring it from view? And what makes the Google Maps location (in the middle of 15th St. NW) any better than the Apple Maps location? Neither one clearly identifies which structure is the Washington Monument. I find it fascinating how this example of the Washington Monument has become a rallying cry for the inaccuracy of the Apple maps application in constrast to Google Maps, and how that claim has spread through reporting and discourse about the map online. Spread, it would seem, without anyone verifying whether it was a good comparison case. Including, at least so far, Apple’s own PR department.